Objective To report perception of fetal movements in women who experienced a stillbirth compared with controls at a similar gestation with a live birth. Setting 41 maternity units in the UK. 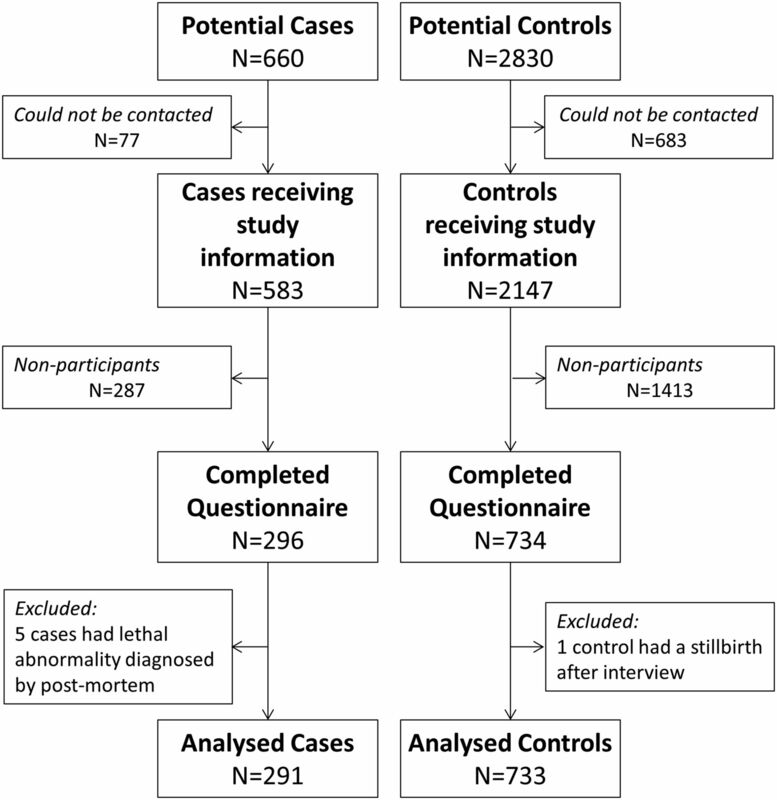 Participants Cases were women who had a late stillbirth ≥28 weeks gestation (n=291) and controls were women with an ongoing pregnancy at the time of the interview (n=733). Controls were frequency matched to cases by obstetric unit and gestational age. Methods Data were collected using an interviewer-administered questionnaire which included questions on maternal perception of fetal movement (frequency, strength, increased and decreased movements and hiccups) in the 2 weeks before the interview/stillbirth. Five fetal movement patterns were identified incorporating the changes in strength and frequency in the last 2 weeks by combining groups of similar pattern and risk. Multivariable analysis adjusted for known confounders. Primary outcome measure Association of maternally perceived fetal movements in relation to late stillbirth. Results In multivariable analyses, women who reported increased strength of movements in the last 2 weeks had decreased risk of late stillbirth compared with those whose movements were unchanged (adjusted OR (aOR) 0.18, 95% CI 0.13 to 0.26). Women with decreased frequency (without increase in strength) of fetal movements were at increased risk (aOR 4.51, 95% CI 2.38 to 8.55). Daily perception of fetal hiccups was protective (aOR 0.31, 95% CI 0.17 to 0.56). Conclusions Increased strength of fetal movements and fetal hiccups is associated with decreased risk of stillbirth. Alterations in frequency of fetal movements are important in identifying pregnancies at increased risk of stillbirth, with the greatest risk in women noting a reduction in fetal activity. Clinical guidance should be updated to reflect that increase in strength and frequency of fetal movements is associated with the lowest risk of stillbirth, and that decreased fetal movements are associated with stillbirth. This is the largest case–control study reporting detailed information about maternal perception of fetal movements in relation to stillbirth. This study addressed different aspects of fetal activity including frequency and strength and hiccups. Attempts were made to reduce recall bias including: using a structured questionnaire and no explicit hypotheses communicated to participants. The recruitment rate was lower than initially expected, 44.1% for cases and 25.9% for controls, which may introduce selection bias. The multivariate model included a prioritised variable that was partially derived from the data obtained in the study, this approach could introduce bias, thus, these observations require replication in further independent data sets. In comparison to a reduction in frequency of fetal movements, little is known about other aspects of maternally perceived fetal activity, such as: strength of movements, an episode of vigorous movement and fetal hiccups and how these relate to risk of stillbirth. Data from two case–control studies and a large international cohort study have both suggested that any significant deviation from a mother’s usual pattern of fetal movement is a risk factor for stillbirth.9 Importantly, existing data suggest that an increase in both strength and frequency of fetal movements in late pregnancy was reported significantly less frequently by women who had a stillbirth.9–11 Due to this paucity of data, it is important to better understand maternal perception of altered fetal activity and whether these perceptions can be used to identify fetuses at high risk of antepartum stillbirth. Furthermore, women report receiving mixed messages about the importance of fetal movements and the significance of RFM, indicating the need for clear information regarding these symptoms.12 To address these needs, we conducted a case–control study to explore modifiable risk factors associated with late stillbirth. The objective of this manuscript is to report maternally perceived fetal movements in women who experienced a recent stillbirth compared with a control group of women at similar gestation who had a live baby. The Midlands and North of England Stillbirth Study (MiNESS) was conducted in 41 maternity units in the UK. The study was registered on www.clinicaltrials.gov (NCT02025530) and the study protocol was published.13 Participants were recruited between April 2014 and March 2016. The study methodology has been described in detail elsewhere.14 Cases were included if the stillbirth occurred at or after 28 weeks gestation and the fetus did not have a congenital anomaly. The cause of stillbirth was assigned using the ReCoDe classification system.15 Controls were women with an ongoing pregnancy. To ensure that controls would be at a similar gestation to cases, the gestation at interview was frequency matched to the expected distribution of stillbirths based on the prior 4 years of data from that unit. Potential controls were randomly selected from the booking lists and the gestation for interview calculated from the expected date of delivery. Women with multiple pregnancies, maternal age less than 16 years and inability to give consent were excluded from the study. The primary outcome reported here was the association of maternal perception of fetal movements with late stillbirth. Maternal perception of fetal movements was classified as increased, reduced or stayed the same. Data specific to this analysis relates to questions asked about fetal movements and more specifically about changes in strength and frequency in the last 2 weeks (before the baby died for cases and last 2 weeks before interview for controls). Additional information was collected on fetal hiccups. Data on uterine contractions were also collected as it has been argued elsewhere that women may interpret uterine contractions as fetal movements.16 All questions as asked are reported in table 1 (the questionnaire is included as online supplementary file 1). Univariable analyses were carried out using logistic regression to estimate the effect of each variable. Due to likely relationships between the variables, bivariate models were fitted between each pair of movement variables to assess (by changes in effect size) which variables were able to be placed in multivariable analyses together. There was a strong association between reduced movements after 26 weeks gestation and the variables for strength and frequency of movements in the last 2 weeks, meaning these variables could not be included in the same multivariable model. Additionally, the question relating to RFM since 26 weeks is complicated by the fact that the time frame relating to this question varies by subjects, that is, 2 weeks for a women at 28 weeks gestation and 15 weeks at 41 weeks gestation. Increase in strength of movements. Increase in frequency but not strength of movements. Decrease in frequency of movements. Unsure of change in strength or frequency. No change in strength or frequency (reference category based on current guidelines). Multivariable analyses were carried out by adding the variables identified as not showing significant collinearity (prioritised strength/frequency variable, frequency of increased fetal movements and frequency of feeling hiccups) to the model previously developed in relation to the risk of stillbirth in this study (maternal: age, ethnicity, parity, education, smoking in pregnancy, marital status, customised birthweight centile,14 sleep factors on the last night before stillbirth/interview (position went to sleep in, sleep duration, number of times got up to toilet), naps in the daytime, gestation and study centre). All analyses were carried out using the logistic procedure in SAS V.9.4 (SAS Institute). MiNESS was developed in response to research questions prioritised in the Stillbirth Priority Setting Partnership according to methodology developed by the James Lind Alliance.17 These included: ‘Do modifiable ‘lifestyle’ factors (eg, diet, vitamin deficiency, obesity, sleep position, sleep apnoea, lifting and bending) cause or contribute to stillbirth?’ and ‘Would empowering women to know about relevant evidence-based signs and symptoms and raise them with healthcare professionals reduce stillbirth?’ Study design and participant materials were designed in conjunction with the Maternal and Fetal Health Research Centre Patient and Public Involvement Group. Participants were not involved in recruitment to or conduct of the study. In total, 3490 women were identified as potentially eligible participants (660 cases and 2830 controls, figure 1). Seven hundred and sixty women could not be contacted (77 cases and 683 controls) and 1700 women did not consent to participate in the study (287 cases and 1413 controls). Six cases were excluded after data collection (five stillbirths had previously unidentified congenital abnormalities detected on postmortem and one control participant had a stillbirth). Cases were more likely to participate than controls (p<0.0001), 291 cases (44.1%) and 733 controls (25.9%) were included in the analysis (figure 1). Flow diagram reporting the numbers of women eligible for the study, women who did not participate and those included in the final analysis. The demographic characteristics of the study population have been presented in detail previously.14 Briefly, the majority of participants were from white ethnic background (80.4% of cases and 81.0% of controls), with a significant proportion of participants from South Asian (13.4% of cases and 13.0% controls) and black ethnic groups (4.1% of cases and 4.0% of controls). Participants’ ages were distributed across the reproductive lifespan, with the largest group between 30 and 34 years of age in both groups (29.6% cases, 36.6% controls). There was no difference in mean body mass index (cases 26.9 kg/m2, controls 26.0 kg/m2). The median gestation at interview was 36 weeks 3 days for controls (IQR 32 weeks 6 days to 38 weeks 5 days). In cases, the median gestation at diagnosis of stillbirth was 37 weeks 4 days (IQR 33 weeks 4 days to 39 weeks 5 days, p=0.003 compared with controls). The median interval between the presumed date of death in utero and diagnosis was 0 days (IQR 0–1) and the median time between the diagnosis of stillbirth and interview was 25 days (IQR 17–35). The most frequent factors associated with stillbirth were fetal growth restriction (45.2%), placental insufficiency (16.4%), placental abruption (6.5%) and acute infection (4.5%). The prevalence of each variable relating to fetal movements and their univariable ORs associated with stillbirth are presented in table 1. Women who reported RFM any time after 26 weeks gestation were at increased risk of having a stillbirth with the risk increasing with the number of times that they reported that decreased movements had occurred ranging from an OR of 2.36 (95% CI 1.69 to 3.30) for one episode to an OR of 5.11 (95% CI 3.22 to 8.10) for three or more episodes. Similarly, women who reported a decrease in either strength (OR 1.61, 95% CI 1.05 to 2.42) or even more so frequency (OR 3.54, 95% CI 2.44 to 5.15) of fetal movements in the last 2 weeks were at increased risk of having a stillbirth compared with those who reported no change. Conversely, increasing strength (OR 0.15, 95% CI 0.11 to 0.22) or frequency (OR 0.38, 95% CI 0.26 to 0.56) of fetal movement was associated with reduced stillbirth risk compared with those who reported no change. There was a significantly decreased stillbirth risk in those reporting more than one episode of vigorous movement (OR 0.34, 95% CI 0.25 to 0.47) and a trend towards increased stillbirth risk in women who felt a single episode of vigorous movement (OR 1.47, 95% CI 0.94 to 2.31) compared with those who never perceived movements to be more vigorous than usual. The combined variable derived from the strength and frequency variables showed that compared with no change in frequency or strength of movement, those who reported increased strength in the last 2 weeks had a decreased risk of stillbirth (OR 0.18, 95% CI 0.13 to 0.26), which was the most commonly reported scenario in controls (62%), while those reporting decreased frequency of movements were at increased risk (OR 3.45, 95% CI 2.20 to 5.43). Maternal perception of fetal hiccups in the last 2 weeks was associated with a decreased risk of stillbirth (OR 0.41, 95% CI 0.30 to 0.54). The magnitude of this reduced risk increased as the frequency of feeling hiccups increased, with the lowest risk for daily perception of hiccups (OR 0.32, 95% CI 0.21 to 0.48). There was no association between feeling contractions in the last 2 weeks and stillbirth (OR 0.97, 95% CI 0.72 to 1.29). The multivariable model (table 2) showed that a decrease in frequency of fetal movements remained associated with increased risk of stillbirth (adjusted OR (aOR) 4.51, 95% CI 2.38 to 8.55) and increasing strength of fetal movements was still associated with decreased risk of stillbirth (aOR 0.14, 95% CI 0.08 to 0.24) compared with no change in perception of frequency or strength of movement in the last 2 weeks. The decreased risk associated with feeling vigorous movements on more than one occasion in the last 2 weeks remained statistically significant (aOR 0.59, 95% CI 0.37 to 0.96), but the association between a single episode of vigorous movement in the preceding 2 weeks and stillbirth became statistically significant (aOR 2.10, 95% CI 1.06 to 4.17). Compared with not feeling hiccups in the last 2 weeks, feeling hiccups daily was associated with a significant reduction in risk (aOR 0.31, 95% CI 0.17 to 0.56). When baby’s movements were reported as less than usual in the preceding 2 weeks, mothers of cases were significantly more likely to have spoken to a health professional (79% vs 70%, p=0.02) and tended to have attended hospital due to RFM more frequently than controls although this did not achieve statistical significance (68% vs 60%, p=0.07). This study shows that the majority of women with a live birth after 28 weeks gestation perceive an increase in strength of fetal movements and feel fetal hiccups in the previous 2 weeks; perception of these patterns of fetal movements is associated with a substantial reduction in the risk of late stillbirth (aORs 0.14 and 0.31, respectively). Conversely, a decrease in the strength or frequency of fetal movements is associated with an increased risk of late stillbirth particularly if this is a recurrent phenomenon (OR 2.36 rising to 5.11). A single episode of vigorous fetal activity is also associated with an increased risk of stillbirth. This study is the largest case–control study that has reported detailed information about maternal perception of fetal movements in relation to the risk of late stillbirth. A comparatively novel feature of this study is that assessment of analysis of fetal activity was not restricted to the frequency of fetal movements, but also addressed changes in strength of fetal activity as well as fetal hiccups. Apart from the Auckland Stillbirth Study (TASS),9 most recent publications evaluating the significance of fetal movements have comprised small cohort studies of women with reduced frequency of fetal movements in centres where intervention may be employed to prevent stillbirth.18 19 By including a broader description of fetal activity, this study has been able to report the frequency and strength of fetal movements in ongoing pregnancy and describe changes that are related to late stillbirth. A case–control design was considered the most practical means to identify late stillbirth, as a prospective cohort study is not feasible, requiring almost 108 000 women to identify 291 late stillbirths (at the current frequency of 2.9 per 1000 births in the UK). However, it is important to consider the potential influence of recall bias, a limitation of case–control studies. This study attempted to minimise recall bias in several ways. Firstly, all participants were asked the same series of questions about fetal movements embedded in a questionnaire about many different factors (eg, smoking, diet, stress, social situation, sleep position and fetal movements). Secondly, women who experienced a stillbirth were interviewed within a median of 25 days, a time when events surrounding the death of a baby are likely to be clearly recalled.20 As women in the control group were pregnant at the time they completed the survey, their experiences or concerns could not have been biased by knowledge of the outcome of their pregnancy. Finally, this study described novel findings of vigorous fetal movements and fetal hiccups, which are rarely addressed in prior studies, reducing the possibility that respondents may have read about these symptoms in advance of the questionnaire. While recall bias cannot be completely discounted, responses from participants’ who had a stillbirth do not universally show a deviation from controls, for example, there was no different in maternal perception of uterine contractions between the two groups. The possibility of selection bias was minimised by recruiting controls who were frequency matched to cases over the duration of the study period which resulted in similar ages and ethnicities in both groups. The recruitment rate of MiNESS was lower than that of the TASS case–control study (cases 45.3% vs 72%; controls 26.2% vs 72%, respectively).21 This may have resulted in part from random selection of controls from booking lists which meant that some of these women could not be contacted and others were approached with no prior knowledge of the study, which given the sensitive subject matter, may have been reduced participation rates. A qualitative substudy was undertaken to further understand the barriers and facilitators to participation in this study for both cases and controls, this will be reported separately. Data regarding the pattern of fetal movements in late pregnancy are limited. Previous literature has suggested that the frequency of fetal movements increases until the 32 weeks of pregnancy and then plateaus.23 24 Studies also note that the type and quality of fetal movements change with advancing gestation.23–26 In this study, the majority of controls reported that the frequency of fetal movements stayed the same (54.3%) but that there was increased strength of fetal movements in most controls (62.8%) in the preceding 2 weeks. Interestingly, an increase in strength of fetal movements had a greater protective effect for stillbirth than increase in frequency (OR 0.15 vs 0.38). These findings are similar to those reported in TASS.9 As ultrasound studies suggest that mothers are more likely to feel larger movements of trunk and limbs,27 an increase in strength may also be perceived as an increase in frequency. Critically, for a reduction in frequency of fetal movements can only be judged in retrospect, whereas, increased strength may be easier to judge in real time which could prompt more rapid reporting of maternal concerns. We were not able to stratify levels of fetal activity by gestation due to insufficient sample size, this will be addressed in a planned individual participant data (IPD) meta-analysis.28 The other studies within the IPD can also be used to determine whether the interaction between strength and frequency is similar, and has similar association with late stillbirth. Although regular vigorous movements are important and protective, a one-off episode of excessive fetal activity may be a warning sign of fetal compromise although the effect size in this study was less than in TASS (aOR 2.10 vs 6.81).9 The repeated identification of this association here strengthens the relationship between a single episode of excessive fetal activity and stillbirth. However, practical application of this association is challenging as a woman cannot know at the time whether an episode of vigorous movement is isolated or will become a part of regular fetal activity. Furthermore, the origin of the excessive movement is unclear.29 Therefore, this association requires further investigation in our planned IPD meta-analysis to establish whether it is consistently observed,28 and whether there are any clues to the aetiology of this symptom. In agreement with many studies since the mid-1970s, we have confirmed that decreased frequency of fetal movements is a major risk factor for late stillbirth.30 Furthermore, this study agrees with data from other UK units that recurrent presentation with RFM is associated with an even greater risk of adverse outcome.31 32 This link is biologically plausible as RFM is associated with abnormal placental structure and function which may deteriorate as pregnancy progresses.5 6 Notably, mothers with recurrent episodes of RFM have been shown to have an increased likelihood of abnormal uterine artery Doppler waveforms in the second trimester and delivery of a small for gestational age infant,31 both of which are associated with abnormal placental morphology.33 34 This study did not have sufficient power to determine whether maternal perception of RFM was related to stillbirths associated with a specific cause (eg, placental dysfunction) but this will be addressed in the IPD meta-analysis. This study demonstrates that maternal perception of increased strength of fetal movements in late pregnancy is protective of late stillbirth. Decreased frequency of fetal movements is associated with risk of stillbirth as is decreased strength. Clinical guidelines and health promotion information currently suggest that fetal movements tend to increase until the 32nd week of pregnancy and then plateau.45 However, data from this study and TASS show that an increase in strength and frequency of fetal movements is associated with the lowest risk of stillbirth suggesting that guidance should be altered to indicate that maternal perception of fetal movement normally increases throughout pregnancy. This study adds to the evidence base that when fetal movements are reduced, there is an increased risk of late stillbirth. Thus, women should contact their maternity care provider and be managed according to current clinical guidance.46 Importantly, development of an effective strategy for the investigation and management of RFM in late pregnancy has the potential to reduce the incidence of late stillbirth. The authors thank all the participants who participated in interviews in order to help us better understand stillbirth. The authors would also like to thank the principal investigators, research midwives and nurses at the following institutions for their hard work and dedication to this study: Airedale NHS Foundation Trust, Birmingham Women’s NHS Trust, Blackpool Teaching Hospitals NHS Foundation Trust, Bradford Teaching Hospitals NHS Foundation Trust, Buckinghamshire Healthcare NHS Trust, Burton Hospitals NHS Foundation Trust, Calderdale and Huddersfield NHS Foundation Trust, Central Manchester Hospitals NHS Foundation Trust, Countess of Chester Hospitals NHS Foundation Trust, County Durham and Darlington NHS Foundation Trust, East Lancashire Hospitals NHS Trust, Harrogate and District NHS Foundation Trust, Heart of England NHS Foundation Trust, Hull and East Yorkshire Hospitals NHS Trust, Lancashire Teaching Hospitals NHS Foundation Trust, Leeds Teaching Hospitals NHS Trust, Liverpool Women’s NHS Foundation Trust, Mid Cheshire Hospitals NHS Foundation Trust, Mid Yorkshire Hospitals NHS Trust, Northern Lincolnshire and Goole NHS Foundation Trust, Portsmouth Hospitals NHS Trust, Royal Wolverhampton Hospitals NHS Trust, Sandwell and West Birmingham NHS Trust, Sheffield Teaching Hospitals NHS Foundation Trust, Sherwood Forest Hospitals NHS Foundation Trust, St Helens and Knowsley Teaching Hospitals NHS Trust, Stockport NHS Foundation Trust, Southport and Ormskirk Hospitals NHS Trust, South Warwickshire NHS Foundation Trust, The Dudley Group NHS Foundation Trust, United Lincolnshire Hospitals NHS Trust, University Hospitals of Coventry and Warwickshire NHS Trust, University Hospitals of North Midlands NHS Trust, University of Morecambe Bay NHS Foundation Trust, Walsall Healthcare NHS Trust, Warrington and Halton Hospitals NHS Foundation Trust, Western Sussex Hospitals NHS Foundation Trust, Wirral University Teaching Hospitals NHS Foundation Trust, York Teaching Hospitals NHS Foundation Trust.
. The definition and the significance of decreased fetal movements. Acta Obstet Gynecol Scand 1983;62:409–13.
. Fetal movements and fetal outcome: a prospective study. Obstet Gynecol 1981;57:431–6. Maternal and Child Health Research Consortium. Confidential enquiry into stillbirths and deaths in infancy: 8th Annual Report, 1 January–31 December 1999. London: Maternal and Child Health Research Consortium, 2001.
. MBRRACE-UK Perinatal confidential enquiry: term, singleton, normally formed, antepartum stillbirth. Leicester: The Infant Mortality and Morbidty Studies, Department of Health Sciences, University of Leicester, 2015.
. Maternal perception of fetal activity and late stillbirth risk: findings from the Auckland Stillbirth Study. Birth 2011;38:311–6.
. Recall bias in a case-control study of sudden infant death syndrome. Int J Epidemiol 1990;19:405–11.
. Maternal perception of fetal movement quality and risk of late stillbirth. J Paediatr Child Health 2018;54(Suppl 1):10.
. Longitudinal measurements of fetal breathing, body movements, heart rate, and heart rate accelerations and decelerations at 24 to 32 weeks of gestation. Am J Obstet Gynecol 1985;151:256–63.
. Spontaneous motor activity in normal fetuses. Early Hum Dev 2001;65:139–47.
. Collaborative IPD analysis of maternal sleep position and late stillbirth (greater than or equal to 28 weeks of gestation). York: Centre for Reviews and Dissemination, 2017. CRD42017047703.
. Fetal hiccups and the umbilical ring. Am J Obstet Gynecol 1991;165(4 Pt 1):1161.
. Hiccups and breathing in human fetuses. Arch Dis Child 1990;65:1072–5.
. Case-control study of factors associated with intrauterine deaths. Med Ged Med 2004;6:53–8. Royal College Of Obstetricians and Gynaecologists. Management of reduced fetal movements. London: RCOG, 2011.
. Saving Babies’ Lives: a care bundle for reducing stillbirth. Leeds, UK: NHS England, 2016. Contributors AEH, TS, BM, DR, EAM and LMEM contributed to all aspects of the study design and obtained funding. AEH had overall responsibility for the study. JB coordinated the running of the study. ML and JMDT analysed the data with input from AEH, JB, RC, BB, EAM and LMEM. All authors were responsible for the drafting of the manuscript. All authors gave approval for the final version of the manuscript. Funding The Midland and North of England Stillbirth Study was funded by grant GN2156 from Action Medical Research, Cure Kids and Sands. Ethics approval This study was reviewed by NRES Committee North West—Greater Manchester Central Reference (13/NW/0874) on 24 January 2014. Data sharing statement No additional data from the MiNESS study are available from a repository. Anonymised data are available on request to the corresponding author.